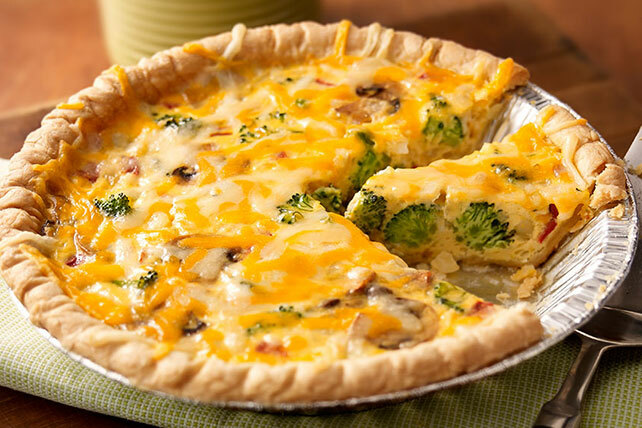 Enjoy a slice of this tasty Three Cheese Quiche that's much more than cheesy: it also includes mushrooms, onions and broccoli. Cook mushrooms, onions and broccoli in skillet sprayed with cooking spray on medium heat 5 min. or until crisp-tender, stirring occasionally. Remove from heat. Whisk eggs and milk in medium bowl until blended. Stir in vegetable mixture, red peppers and 1/2 cup cheese; pour into pie crust. Place on baking sheet. Bake 35 min. Top with remaining cheese; bake 5 to 10 min. or until knife inserted in center comes out clean. Let stand 10 min. before cutting to serve.